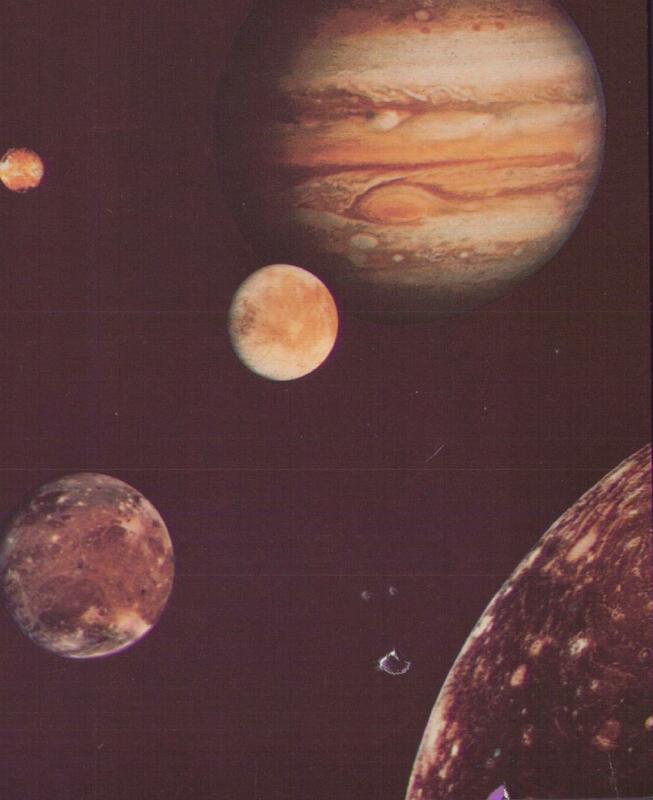 Jupiter and its four planet-size moons, called the Galilean satellites, were photographed in early March 1979 by Voyager 1 and assembled into this collage. They are not to scale, but are in their relative positions. Reddish Io (upper left) is nearest Jupiter; then Europs (center); Ganymeded and Callisto (lower right). Nine other much smaller satellites circle Jupiter, one inside Io's orbit and the others millions of miles from the planet. Not visible is Jupiter's faint ring of particles, seen for the first time by Voyager 1. The Voyager Project is managed for NASA's Office of Space Science by the Jet Propulsion Laboratory of the California Institute of Technology. You know I wanted this postcard. I'd just recently seen the mind-blowing poster of Jupiter in my kindergarten classroom. NASA still does these weird collages and it never looks good. They should take a tip from postcard design, and feature each moon of Jupiter (or whatever) in its own labeled box.